Gurbani, B. (2008). Artificial limbs. In Y. Zhang, Encyclopedia of global health. [Online]. Thousand Oaks: Sage Publications. Available from: https://search.credoreference.com/content/topic/artificial_limb [Accessed 25 April 2019]. Gurbani, Barkha. "Artificial Limbs." Encyclopedia of Global Health, Yawei Zhang, Sage Publications, 1st edition, 2008. Credo Reference, https://search.credoreference.com/content/topic/artificial_limb. Accessed 25 Apr. 2019. Device to replace a limb that has been removed by surgery or lost through injury, or one that is malformed because of genetic defects. It is one form of prosthesis. An early example, exhibited in the Royal College of Surgeons in London, is said to have been made around 300 BC. It is an artificial leg, made with pieces of thin bronze fastened to a wooden core; the foot was probably made of wood. Artificial limbs are a type of prosthesis that replaces a missing part of the body. They are classified by the type of amputation they replace, for example, below the knee, above the knee, below the elbow, or above the elbow. For congenital (from birth) defects the terms refer to the affected body part. After an amputation, a patient may need to work with a rehabilitation specialist, such as a physical therapist, who will develop a personalized plan. This plan starts with ensuring proper healing of the amputation and includes exercises to keep the muscles and joints healthy and strong. The ultimate goal is for the patient to be able to use a prosthetic arm or leg in much the same fashion as the original limb. A variety of prostheses are available. Although artificial limbs used to be made from wood and certain types of metal, they have now been replaced with lighter materials such as fiberglass. 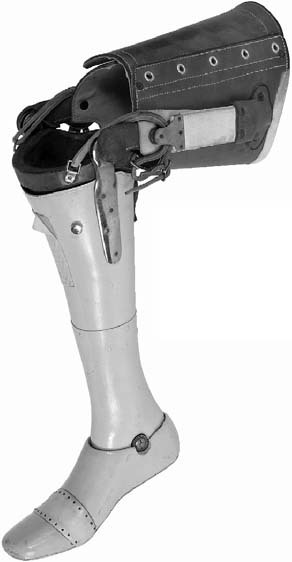 Artificial limbs in the past had no mobility; they were replaced with models that had joints that could be bent (if unnaturally and not automatically) and fixed in different positions for different types of activities (e.g., sitting and walking). These, in turn, were replaced with robotic models capable of moving by themselves when controlled by an internal computer or directly by the user. In the past, they would be controlled by other muscles (such as those on the back), but today, direct neural control is preferable. In direct neural control of prosthetic limbs, limbs and appendages are moved by muscles that are stimulated by very small amounts of electricity from the nervous system. Even if the limb or appendage is absent, the nerves and impulses controlling the missing limb are (usually) still there, and the brain can send electricity to guide a “phantom” limb. If these currents are amplified and sent to a motor in the artificial limb, that limb can be moved via the same method used to control natural limbs. The current challenge for medical science is to perfect the system. In September 2005, Popular Science reported on a prototype neurally controlled limb developed by the Rehabilitation Institute of Chicago’s amputee program. This prosthesis required a unique surgery that rerouted multiple nerves that once connected to the arm of the user, to their chest, where the nerves interfaced with various electrodes. This design is the first neurally controlled prosthesis to move simultaneously at the shoulder, elbow, and wrist. It contains a 64-bit computer to coordinate its movements and allows the user to actually sense pressure when grasping an object. Many people in developing countries, particularly victims of landmines, cannot afford even the most basic artificial limbs. Antipersonnel landmines are often used indiscriminately and frequently result in injury or death of noncombatants. In the last 65 years, over 110 million mines have been spread throughout the world into an estimated 70 countries. Landmine victims use a disproportionately high amount of medical resources; the vast majority of incidents occur in regions and countries without a sophisticated medical infrastructure and with limited resources, where rehabilitation is difficult in the best of circumstances. It is estimated that only a quarter of the patients with amputation secondary to landmines receive appropriate care. The Department of Mechanical Engineering at the University of Waterloo (Canada) is currently developing a semiactive prosthetic leg geared specifically for land-mine victims in Afghanistan. This prosthetic is geared specifically for transfemoral amputees. Artificial limb technology has been continually refined, and simple early prostheses have since been replaced by robotic models with direct neural control. Many people with prosthetic limbs are able to continue to participate in sports. Interest and participation in disabled sports is growing rapidly nationally and internationally. In the first international Paralympic Games, which were held in Rome in 1960 after the regular summer Olympic Games, 400 athletes from 23 countries participated. The Paralympics is organized in a similar fashion to the Olympics. Athletes are categorized by their disability and grouped for competitions. This international competition is at a similar level to the able-bodied Olympics. The competitions are held every four years at the same venue as the Olympic competitions during the summer and winter. Between Olympic seasons, international world cup–level competitions are held. Most of the same countries that send athletes to the Olympics sponsor athletes to the Paralympic Games. Amputees; Bone Cancer; Bone Diseases; Bone Health; Elbow Injuries and Disorders; Leg Injuries and Disorders; Rehabilitation; Shoulder Injuries and Disorders; Wrist/Arm Injuries and Disorders. Jesse C. DeLee; David Drez; Mark D. Miller, DeLee and Drez’s Orthopaedic Sports Medicine, 2nd ed. (Saunders, 2003). V. Putti, “Historic Artificial Limbs,” Clinical Orthopaedics and Related Research (v.412, 2003).